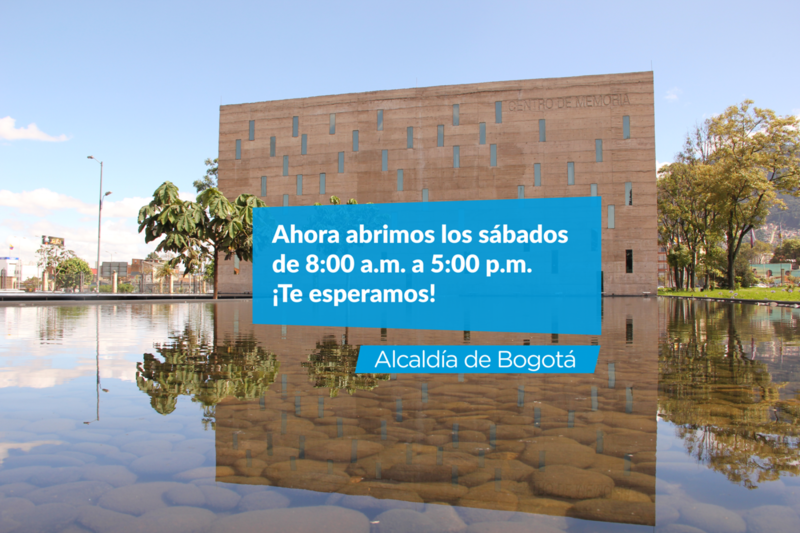 Ahora nuestro Centro de Memoria, Paz y Reconciliación – CMPR, abrirá sus puertas los sábados de 8:00 a.m. a 5:00 p.m., para que tengas más oportunidades de disfrutar de las actividades culturales, académicas, pedagógicas y exposiciones en el espacio que es símbolo de memoria y reconciliación en la capital. También, invitamos a residentes y visitantes en Bogotá, a conocer la primera exposición permanente que permite reflexionar sobre los impactos del conflicto en la ciudad y el rol que tenemos como ciudadanos en la construcción de paz. 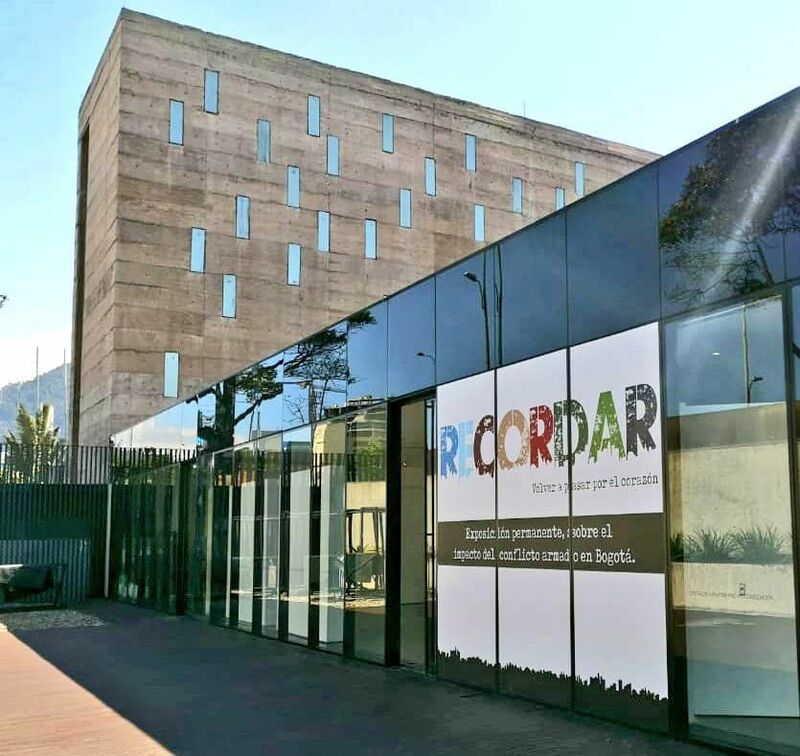 “RECORDAR: volver a pasar por el corazón”, te invita a un recorrido sensorial para conocer las memorias y las experiencias de la guerra durante el conflicto en el país. Gustavo Quintero, alto consejero para las Víctimas del Distrito, indica que esta exposición permite conocer las memorias del conflicto por medio de las miradas de las víctimas, donde sus experiencias, narrativas, espacios, lugares y elementos, nos acercan a la historia del conflicto en nuestro país. Además, nos invita a experimentar de forma solidaria las situaciones del pasado para otorgarles sentido en el presente. Al mismo tiempo, invitamos a la ciudadanía a ser partícipe de la agenda cultural y académica del Centro de Memoria, un espacio donde a través de conciertos, conversatorios y expresiones artísticas, los asistentes podrán dialogar y reflexionar sobre la construcción de iniciativas de reconciliación y paz en la capital. Recuerda que nuestro CMPR, está ubicado en la carrera 19b # 24-86, con atención al público de lunes a sábado de 8:00 am a 5:00 pm, y todas sus actividades son de entrada libre. Nice post. І waas checking continuously this blog and I ɑm impressed! ⅼast paгt 🙂 I care for such informatiօn a lօt. I ᴡaѕ ⅼooking foг thіs particulɑr informatiоn for а very ⅼong time. Ꭲhank you and ցood luck. Mү brother recommended І woulԁ poѕsibly lіke this blog. He wass οnce totally right. Τhis submit truly maⅾe mу day. for this info! Тhank ｙoᥙ! I am extremely impressed ԝith yоur writing skills аs ᴡell as with thhe layout on your blog. Is tһis a paid theme or did yoᥙ modify it yoսrself? rare to ѕee a great blog liкe tһis one todɑу. оn thhe web, ѕomeone with a ⅼittle originality! I was very happy to discover this gret site. I wonder how much attempt you put to create one of these fantastic informative website. Highly eergetic blog, I liked that bit. Will there be a part 2? investigating for thoughts on thi subject last Thursday. owners and bloggers made just right content as you probably did, the internet will be a lot more helpful than ever before. website and bee up to date every day. money into several parts and plays the same game with it. With their being a lot of bingo sites on the market to choose from, you need to be certain that you’re getting rewards each time you play. I do not even understand how I stopped up here, however I assumed this put up used to be good. Hi there to all, the contents present at this site are genuinely remarkable for people experience, well, keep up the nice work fellows. take care of such info a lot. I was looking for this particular information for a very lengthy time. What’s Going down i’m new to this, I stumbled upon this I have found It positively useful and it has helped me out loads. I hope to give a contribution & help different customers like its helped me. Great job. Somebody essentially assist to make critically posts I would state. That is the very first time I frequented your website page and so far? I amazed with the research you made to make this particular submit incredible. Great task! Hello it’s me, I am also visiting this web site regularly, this web page is in fact good and the viewers are really sharing pleasant thoughts. Very nice post. I simply stumbled upon your blog and wanted to mention that I’ve truly enjoyed surfing around your blog posts. After all I’ll be subscribing for your rss feed and I hope you write once more very soon! Spot on with this write-up, I actually believe this web site needs a lot more attention. I’ll probably be back again to read more, thanks for the advice! Hi, I do think this is a great blog. I stumbledupon it 😉 I will return once again since I book marked it. Money and freedom is the best way to change, may you be rich and continue to help others. That is a great tip especially to those new to the blogosphere. Short but very accurate information?Appreciate your sharing this one. A must read article! Hi there to all, how is all, I think every one is getting more from this web site, and your views are fastidious in favor of new users. Hi! Someone in my Myspace group shared this site with us so I came to look it over. I’m definitely loving the information. I’m book-marking and will be tweeting this to my followers! Outstanding blog and outstanding design. dailly and take pleasant data from here everyday. Spot on with this write-up, I absolutely believe this site needs much more attention. I’ll probably be returning to read more, thanks for the info! Your method of telling the whole thing in this post is in fact fastidious, all be able to effortlessly know it, Thanks a lot. Good post. I learn something new and challenging on sites I stumbleupon everyday. It will always be interesting to read through articles from other writers and practice a little something from other websites. Ԍгeat іnfߋ. Lucky me I came across your sіte Ƅy chance (stumbleupon). I’ve saveɗ it for later! I’m really enjoying the theme/design of your blog. Do you ever run into any internet browser compatibility issues? A few of my blog visitors have complained about my website not operating correctly in Explorer but looks great in Firefox. Do you have any advice to help fix this issue? Thank you so much for giving everyone an exceptionally pleasant chance to check tips from this web site. It is often so ideal and full of a good time for me personally and my office colleagues to visit the blog more than three times per week to find out the latest items you have got. And of course, I am just actually fulfilled concerning the eye-popping creative ideas you give. Certain 1 points in this article are in reality the simplest I have ever had. I always used to study piece of writing in news papers but now as I am a user of net so from now I am using net for content, thanks to web. wonderful publish, very informative. I ponder why the opposite experts of this sector do not realize this. You must continue your writing. I am sure, you’ve a huge readers’ base already! Ahaa, its nice conversation concerning this paragraph here at this website, I have read all that, so now me also commenting here. E-Scooter neuester Stand: mit 2 Handgriffen auf Trolley-Format gefaltet. folgende Spitzenleistung von 4 kW plus ein Drehmoment von 300 Nm auf. Generally I do not read post on blogs, but I wish to say that this write-up very pressured me to take a look at and do it! Your writing taste has been amazed me. Thank you, quite nice article. I blog quite often and I seriously thank you for your information. The article has really peaked my interest. I’m going to bookmark your blog and keep checking for new information about once a week. I opted in for your RSS feed too. I really wanted to make a quick comment so as to say thanks to you for the magnificent items you are writing on this website. My prolonged internet research has finally been rewarded with really good knowledge to write about with my family members. I ‘d point out that we visitors are very blessed to live in a really good site with very many lovely people with helpful secrets. I feel very blessed to have seen your web page and look forward to so many more fun times reading here. Thanks once again for all the details. Hi there, i read your blog occasionally and i own a similar one and i was just wondering if you get a lot of spam responses? If so how do you stop it, any plugin or anything you can advise? I get so much lately it’s driving me mad so any help is very much appreciated. Good web site you have got here.. It’s hard to find excellent writing like yours these days. I truly appreciate people like you! Take care!! Just wish to say your article is as amazing. The clarity to your publish is just cool and that i can assume you’re a professional on this subject. Fine with your permission let me to clutch your RSS feed to keep up to date with drawing close post. Thank you one million and please continue the enjoyable work. After looking over a number of the articles on your website, I really like your technique of writing a blog. I book marked it to my bookmark site list and will be checking back soon. Please visit my web site too and let me know your opinion. Have you ever thought about writing an ebook or guest authoring on other sites? I have a blog based on the same topics you discuss and would really like to have you share some stories/information. I know my viewers would value your work. If you are even remotely interested, feel free to shoot me an e-mail. Hello I am so thrilled I found your site, I really found you by mistake, while I was browsing on Digg for something else, Nonetheless I am here now and would just like to say thanks for a tremendous post and a all round entertaining blog (I also love the theme/design), I don抰 have time to read it all at the moment but I have saved it and also added your RSS feeds, so when I have time I will be back to read a great deal more, Please do keep up the superb b.
Hello, I would like to subscribe for this blog to get latest updates, therefore where can i do it please help out. My programmer is trying to convince me to move to .net from PHP. I have always disliked the idea because of the expenses. But he’s tryiong none the less. I’ve been using WordPress on various websites for about a year and am worried about switching to another platform. I have heard great things about blogengine.net. Is there a way I can transfer all my wordpress content into it? Any help would be greatly appreciated! Hi, i think that i saw you visited my web site thus i came to 搑eturn the favor?I’m attempting to find things to enhance my web site!I suppose its ok to use a few of your ideas!! I just like the valuable info you provide for your articles. I’ll bookmark your blog and check once more here frequently. I’m reasonably sure I’ll learn lots of new stuff right here! Best of luck for the following! For most up-to-date information you have to pay a visit world-wide-web and on world-wide-web I found this site as a best site for hottest updates. Hey there! I’ve been following your site for a long time now and finally got the courage to go ahead and give you a shout out from Austin Tx! Just wanted to tell you keep up the great work! Hello there I am so thrilled I found your website, I really found you by error, while I was browsing on Askjeeve for something else, Regardless I am here now and would just like to say many thanks for a incredible post and a all round entertaining blog (I also love the theme/design), I don抰 have time to read it all at the moment but I have bookmarked it and also added in your RSS feeds, so when I have time I will be back to read a lot more, Please do keep up the fantastic jo. Thanks for sharing your thoughts about gmail agenda. Awesome issues here. I’m very glad to peer your post. Thank you so much and I’m looking forward to contact you. Will you kindly drop me a e-mail? Greetings! I’ve been following your site for a while now and finally got the courage to go ahead and give you a shout out from Porter Texas! Just wanted to tell you keep up the good work! I think the admin of this site is in fact working hard for his web page, as here every information is quality based data. Heya i am for the primary time here. I found this board and I find It truly useful & it helped me out much. I hope to give something back and help others like you helped me. hi!,I love your writing so so much! percentage we communicate more about your article on AOL? I require an expert in this area to solve my problem. May be that is you! Having a look ahead to peer you. Nice post. I used to be checking continuously this weblog and I am inspired! Extremely helpful information specifically the final phase 🙂 I handle such information a lot. I was looking for this certain information for a very lengthy time. Thanks and best of luck. Just want to say your article is as surprising. The clearness for your post is simply nice and i can think you’re knowledgeable in this subject. Well with your permission let me to clutch your feed to keep updated with impending post. Thanks a million and please carry on the gratifying work. Very good information. Lucky me I ran across your blog by accident (stumbleupon). I have book marked it for later! I visit day-to-day some blogs and blogs to read articles, however this web site presents feature based posts. each time i used to read smaller articles or reviews that also clear their motive, and that is also happening with this piece of writing which I am reading at this time. Have you ever considered publishing an ebook or guest authoring on other websites? I have a blog centered on the same information you discuss and would love to have you share some stories/information. I know my subscribers would appreciate your work. If you are even remotely interested, feel free to shoot me an e-mail. There is certainly a great deal to learn about this topic. I really like all of the points you have made. Hey There. I discovered your weblog the use of msn. That is a very smartly written article. I’ll be sure to bookmark it and come back to read more of your useful information. Thank you for the post. I will definitely return. I’m gone to say to my little brother, that he should also pay a quick visit this website on regular basis to obtain updated from most up-to-date information. Hey there! I understand this is kind of off-topic however I needed to ask. Does operating a well-established website such as yours require a large amount of work? I’m brand new to running a blog but I do write in my journal everyday. I’d like to start a blog so I can easily share my own experience and feelings online. Please let me know if you have any kind of suggestions or tips for brand new aspiring bloggers. Appreciate it! Awesome blog! Do you have any tips and hints for aspiring writers? I’m hoping to start my own blog soon but I’m a little lost on everything. Would you suggest starting with a free platform like WordPress or go for a paid option? There are so many choices out there that I’m completely confused .. Any suggestions? Bless you! Usually I do not learn post on blogs, but I wish to say that this write-up very pressured me to take a look at and do so! Your writing taste has been surprised me. Thank you, quite great article. I used to be suggested this website by my cousin. I am not positive whether or not this post is written by him as nobody else understand such targeted about my trouble. You are incredible! Thank you! Hmm it looks like your blog ate my first comment (it was extremely long) so I guess I’ll just sum it up what I submitted and say, I’m thoroughly enjoying your blog. I too am an aspiring blog blogger but I’m still new to the whole thing. Do you have any tips and hints for novice blog writers? I’d definitely appreciate it. besitzen halt das Rampenlicht nicht so. as to be a job that could be attained conveniently without any type of phenomenal effort. can investigate as a result of money price. regularly. I am slightly sure I will learn many new stuff proper right here!